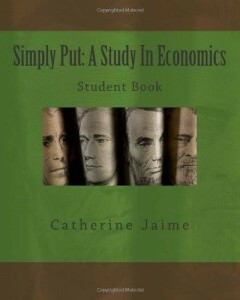 I recently received a paperback copy of Simply Put: A Study in Economics by to review in our homeschool. 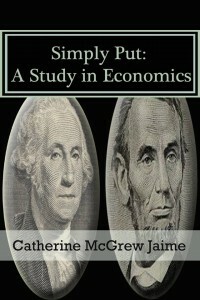 Simply Put: A Study in Economics is written by Catherine Jaime, who has written several books and booklets on American history and economics. She also is a fellow homeschool mom. Since this book is written for high school students, I am using it with my 15 year old, 9th grade daughter. Simply Put: A Study in Economics is divided into 36 lessons. There is a mid term exam, as well as a final exam, included in the book. The midterm is written to cover the first 18 lessons. You can use Simply Put: A Study in Economics as a one semester/half credit course by doing two lessons a week. If you would like to use the course for the whole year, you can use one lesson a week along with some additional work to make it a full course worthy of a full credit. Additional work could include reading books, watching videos, and reading economics related newspapers and magazines. There is an additional reading list included in the book, along with a few economics websites that you can use. There are eight appendices in the book, including a couple of activities for the student, and a brief timeline of the Great Depression. There is also a glossary. The Teachers Key includes the answers to both the Mid-Term Exam and the Final Exam, as well as two additional student activities. I am loving Simply Put. I like it a lot better that what I have used with my older children for their economics credit. The lessons are interesting, with black and white pictures, drawings, and graphs. Simply Put is easy to read, for the student and for the parent. Even if you didn’t take economics in school yourself, this book will make it easy to teach your children economics. The lessons are anywhere from one page long to six pages. Most can be read in one sitting by the student. Leaving plenty of time for discussions, additional work, or the lesson review questions included. The lesson review questions can be used as discussion questions, or as written assignments for the student. My daughter has enjoyed reading the lessons and has learned a lot from using Simply Put. She is going to continue the book for her economics credit. Those are great prices for an excellent high school economics course! Right now, there is a huge giveaway going on over at Bow of Bronze to celebrate the launch of Simply Put: A Study in Economics. They are giving away the complete collection of digital titles by Catherine Jaime, including Simply Put, plus a 3 month subscription to A+Tutorsoft in the grade level of your choice. The total retail value for this giveaway is $325+! So after you enter my giveaway below, hop on over to Bow of Bronze to enter that awesome giveaway! I’m happy to be able to giveaway a digital copy of Simply Put: A Study in Economics Digital Edition, both the student text & the teachers edition! Simply fill out the Rafflecopter form below to enter. *This post contains affiliate links. If you click the link and purchase the book, I will receive a commission. Next PostSaturday on the Farm – Winter! Economics should be required for everyone! Teaching my children what God’s Word says about finances not just the way the world’s economy is. Learing and teaching my children what God says about Money and Spending or saving.